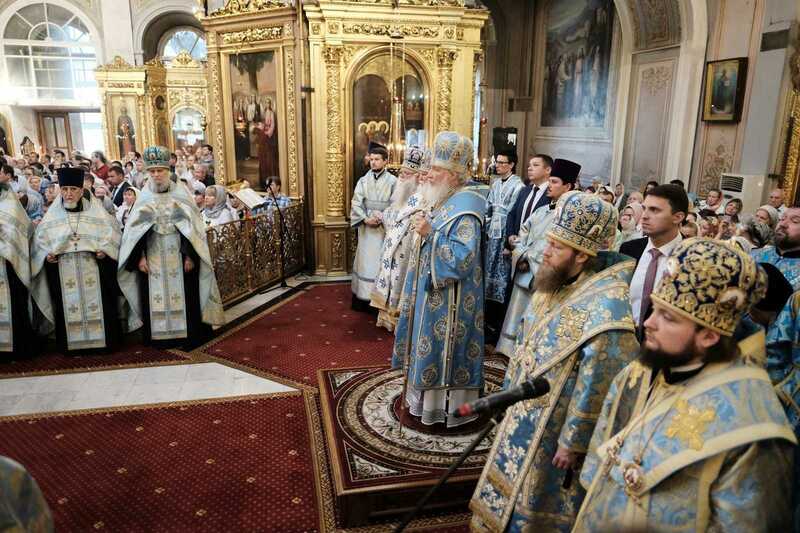 On July 20, 2018, on the even of the feast of the Appearance of the Icon of the Most Holy Theotokos in the city of Kazan, His Holiness Patriarch Kyrill of Moscow and All Russia served the All-Night Vigil in the Theophany Cathedral in Elokhov, Moscow. Metropolitan Valentin (formerly of Orenburg), Metropolitan Savva of Tver and Kashin, First Deputy Administrator of the Department of Internal Affairs of the Moscow Patriarchate, Archbishop Peter of Chicago and Mid-America, Bishop Seraphim of Peterhof, Rector of the St. Petersburg Theological Academy, Protopresbyter Vladimir Divakov, Secretary of the Patriarch of Moscow and All Russian for the City of Moscow, Archpriest Alexander Agaekin, Rector of the Theophany Cathedral of Moscow, Archpriest Sergiy Chukheny, Rector of the church of St. Apostle James [son of] Zebedee in the Kazena Sloboda of Moscow and the Church of the Resurrection in Slovushii in Barashi of Moscow; Protopriest Andrei Marushchak, clergyman of the cathedral church of Christ the Savior of Moscow; priest Alexander Volkov, Head of the Press Service of the Patriarch of Moscow and All Russia; the clergy of the Epiphany Cathedral. Present in the temple were: Chairman of the Committee on Economic Policy of the Federation Council of the Federal Assembly of the Russian Federation D.F. Mezentsev; Deputy Chairman of the Board of Directors of "PhosAgro" A.G. Guriev. Among the faithful at the service were the participants of the third youth educational volunteer forum "DobroLeto. Territory of Faith”, taking place from July 15 to 22, 2018 in Sergiev Posad. The hymnography was provided by the right and left choirs of the Epiphany Cathedral (regents AK Maiorov and E. Yu. Loginova). At the end of the all-night vigil on the territory of the Epiphany Cathedral, participants of the youth forum "Dobrolo. 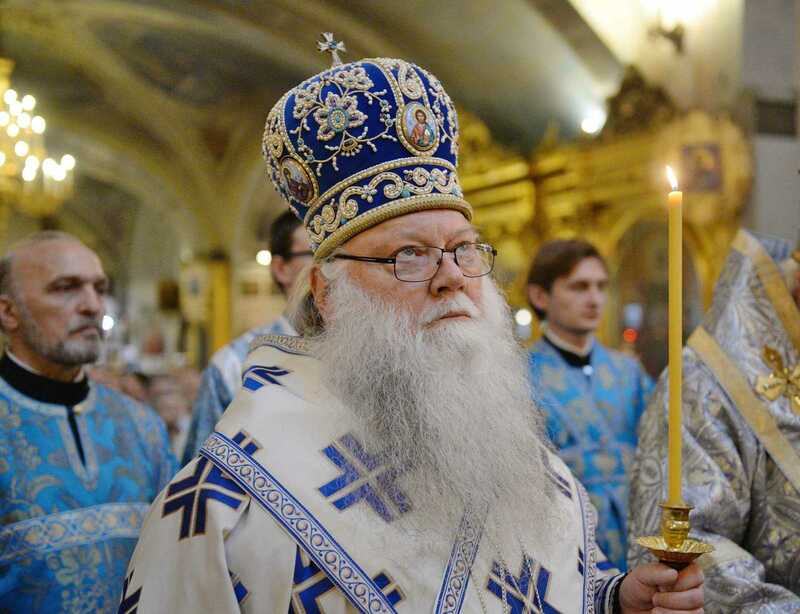 Territory of Faith "welcomed the Primate of the Russian Orthodox Church. This year the forum has become an integrated platform of two annual festivals - the Youth Forum "Dobrolo", as well as the Eurasian Forum of Cossack Youth "Cossack Unity". A tent camp was organized for the participants of the forum at the Sergiev Posad Annunciation field, which has everything necessary for living in the tent camp. Tomorrow, on the day of the celebration of the icon of the Most Holy Theotokos in the city of Kazan, His Holiness Patriarch Kirill will perform the Divine Liturgy at the Kazan Church of the Podvorie of the Protection Stavropegial Convent in the village of Markovo, Ramensky District, Moscow Region.